Your eyes is not mistaken. Yes! IT is SAO(SWORD ART ONLINE) launcher for android devices released by LEGS Singapore Pte. Ltd. and Anifone last August 2, 2014. 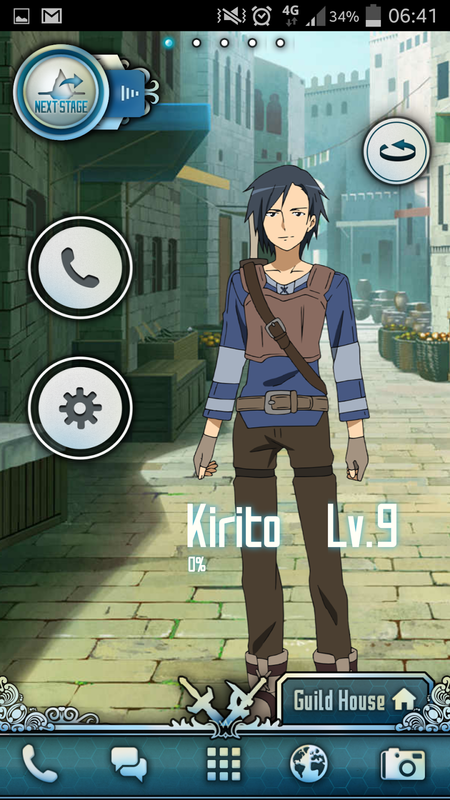 The app was based on the popular hit anime SWORD ART ONLINE. Once you finish the download, the System will ask you to replace your current launcher. And once you finished the additional files required, the app will guide you on how to use it. At first you will have to enter your GUILD name, and choose either Asuna or Kirito. Then you will be directed to your home screen with the character you have in the home screen this characters have certain apps assigned to them and you can changed this but long tapping the button. Sadly, you cannot change the app assigned to Kirito, Asuna and Yui-chan. You can only have 5 characters in your homescreen and you can change them if you have other character available. These characters will level up by using the app assigned to them frequently. Note that there is a daily limit on the level you will have for your character. Event’s will open once you reach the certain level required all the character you have on your party. 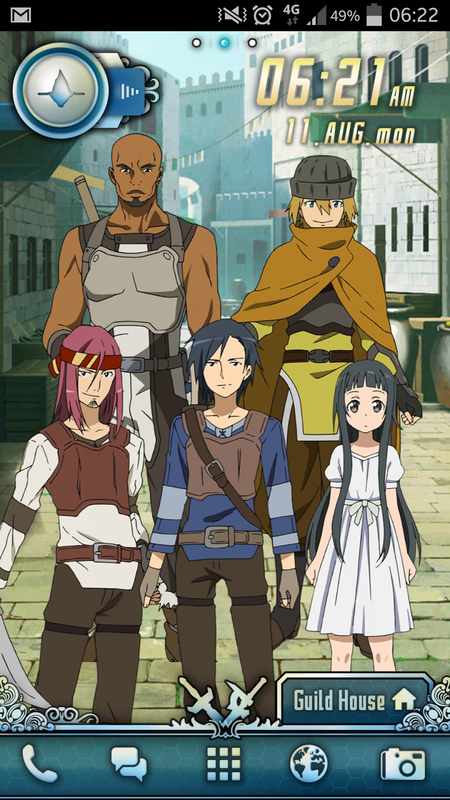 The storyline was based on Season 1 of the series. So if you are familiar with the anime, You will surely follow this and will recognize the characters in the launcher. There are certain unlocks you will have in the app. Character costumes, Background Images, Calculators, Events, etc. This can be acquired if you finished a certain event or Buy them if you have enough Col or Crystal. 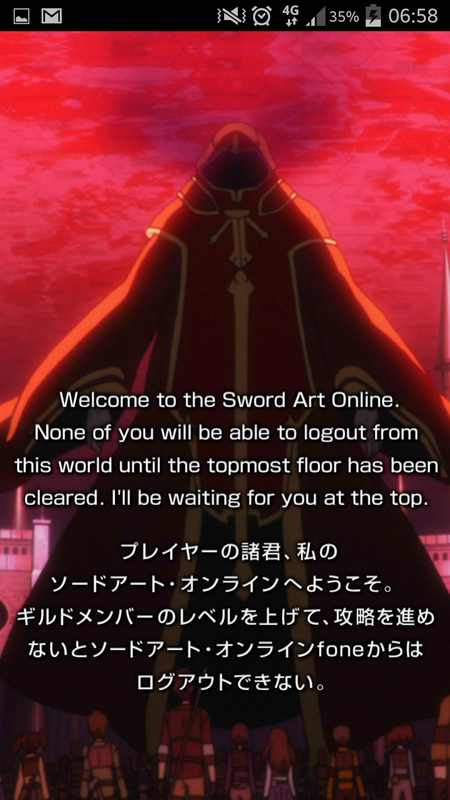 Yes Col is the currency in SAO. You can also buy this with real world money and have staff unlocked. great! 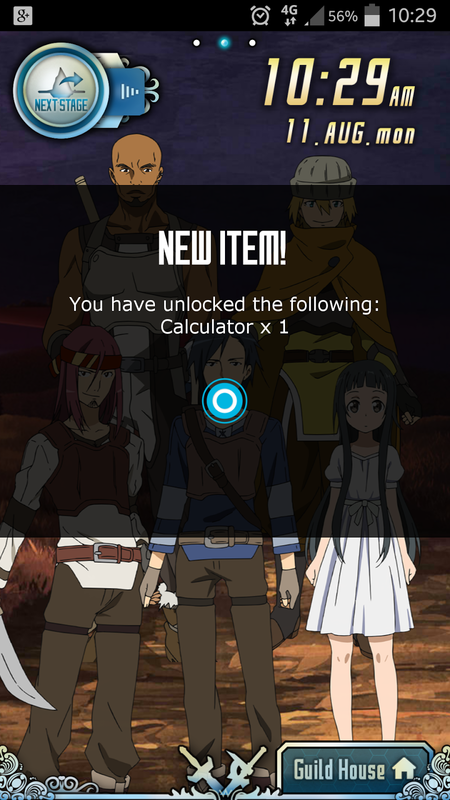 I have unlocked a calculator. This will help me in my everyday life! There is also a BOSS BATTLE but you will have to download a separate app to have this event. There are separate app which you will need to download to be able to utilize the whole launcher. You will need at least 750 MB of space available on your device in order to install all the parts of this application. The idea for this particular launcher is great having one of my favorite anime themes being used. But holy sheep! the app is too slow! Whenever I open an app assigned to one of the characters, it takes about 4-5 seconds for it to load. 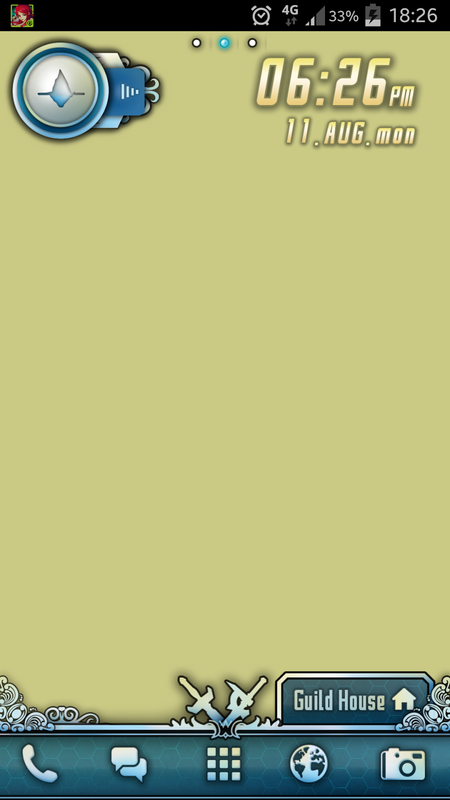 It is so buggy! The RAM and battery usage is so high! I was very disappointed that the 5 days I have spent on leveling the character was gone after the app crashed. The graphics and the widgets included like calculator, alarm clock, etc is good. There is also sounds but not noticeable.The unlock system is not that good, when you unlock a certain character or event clips, you will have to buy them in order to use them. Well the Boss fight, I did not get to it because the app crashed and do not display anything after the app loads. Hate me for this but this game is awful as of now and will not recommend this for now. With what i have experienced, the issues should be fixed immediately. I hope the developers are working on this cause the launcher is so great and fun. Do not let this be a waste.